Whether you're a couple or married with children, managing the intricacies of a household--keeping up-to-date with everyone's schedules, tracking chores, making grocery lists, and formulating travel plans--can be a handful. To help out, we've collected six great mobile apps (many with complementary websites) that can help you stay on top of these challenges. Cozi Calendar lets you see your family's schedule while you're out and about on the road. A free online family organizer and mobile app available for iOS, Android, and BlackBerry, Cozi provides a simple way to put everyone's schedule on the same page. Most impressive is its calendar, which is easy to navigate and color-coded for each member of the family. That level of scheduling assistance can help ensure that Joanne gets to basketball practice on time and Jimmy doesn't miss out on his turn to mop the kitchen floor. Activities for the week are easy to input, and you can set them to recur regularly. You can also choose to have Cozi notify you of an event via email or text. All members of your Cozi circle--which can include grandparents, and friends--can see your calendar, so all of the key players are in the loop if you'd like to ask grandma to watch the kids for an evening, or if you want to invite your best friend to attend your daughter's ballet recital. If you use a calendar application other than Cozi, you can import individual Cozi circle member's Cozi schedules into it. Conversely, you can export your Google, Apple iCal, or Outlook calendar into Cozi. In either situation, the imported calendar will be accessible as a view-only file. To enable full editing, you must download Cozi Outlook Toolbar. 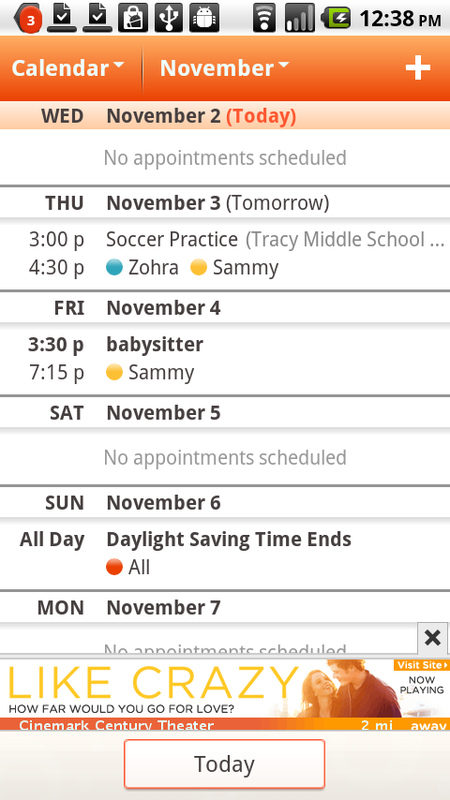 The mobile version of Cozi lacks the ability to filter an individual member's calendar (so that, for example, you access only Dad's calendar entries); this feature is available exclusively on the Web version of the app. 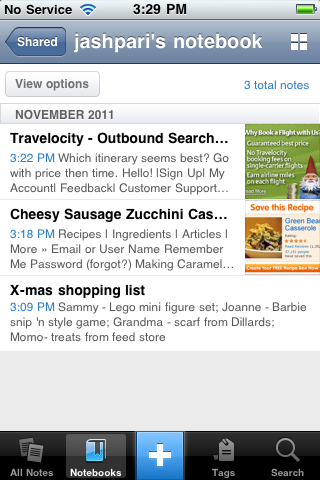 Share your Evernote notebook with your partner to keep everyone on the same page. Many a domestic altercation might have been avoided if the contenders had shared some piece of vital information early on. But how do you make that kind of sharing a reality if you and your partner rarely have time to talk over plans and upcoming time commitments? The answer may come from an app many people already use: Evernote. You can use this versatile note-taking service to share information such as recipes (handwritten or clipped from the Web), holiday shopping lists (with boxes to mark), pictures of furniture you may want to purchase, or an audio recording of your thoughts about an upcoming home remodel. If you have a free Evernote account and share a laptop with your partner, though, you significant other will be able to read your notes but not add to them. Editing privileges among other perks, are reserved for premium account holders, who must pay $5 a month or $45 a year for the privilege. 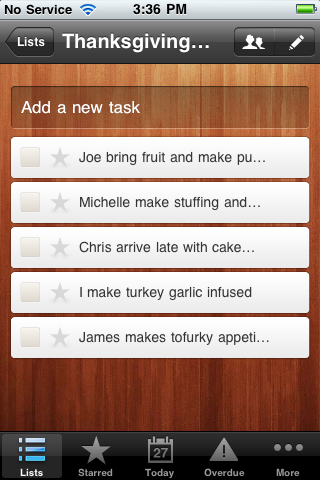 Use Wunderlist to ensure that Thanksgiving chores get spread fairly around the family. Wunderlist, a free app, works across iOS, Windows, and Android. Unlike Evernote, which basically serves as a brain dump of notes, Web clippings, and other information, Wunderlist is geared toward managing tasks that have due dates. You can receive email reminders of your chores if you like. Though designed for a single user, Wunderlist does offer some sharing properties--most notably, the ability to email or text a specific shopping list or task to a family member. For instance, you can share the task of cooking for Thanksgiving dinner with your spouse (with notes detailing your partner's responsibilities), or you can dispatch a Christmas decoration shopping list (since you did the buying last year!). To share your task list, you upload it to CloudApp, an online file-sharing service. Sharing lists online is a feature available only on the Web version of Wunderlist. When you upload a list, the Wunderlist website generates a unique URL that you can send to friends--although again, as with Evernote, your friends won't be able to alter your list. Create a list of groceries fast with GroceryIQ's great feature set. When you need to whip up a grocery list in a hurry, GroceryIQ is a good bet. Available in versions for iOS and Android, the app is noteworthy because it provides an impressive feature set for managing your shopping list. You can search for an item by typing (brand names will pop up if you wish to specify them) or by speaking aloud. The voice recognition feature is quite accurate and nifty when you don't have the time to type. If you want another container of the same orange juice or cereal that you already have on hand, you can quickly input the items by using GroceryIQ's barcode scanner. After compiling your list, you can share it with someone else, though the recipient must individually register for the app. GorceryIQ's syncing is occasionally unreliable and slow. A rival app, Mighty Grocery, is better in this respect, but its interface is more complicated than GroceryIQ's, and you have to upgrade from the free version to the full ($2.99) version if you wish to use Mighty Grocery's barcode scanner. ShopSavvy allows you to compare prices of the same item with ease. Have you ever wondered while you were out shopping whether you could buy the same item elsewhere for a better price? The answer is most likely "Yes," but how do you find out quickly? With the ShopSavvy Barcode Scanner app, you can scan an item's barcode with your phone--or search for it manually--to call up a comparison of prices at local stores and on the Web. In case you're not sure whether the item is right for you, ShopSavvy also offers user reviews. If you decide to make the purchase at another local store, ShopSavvy will provide you with the store's address, map the location, or let you call the competing merchant with one press. A word of caution about searching local stores: ShopSavvy doesn't search smaller, independent stores, and its prices may not be completely up-to-date. Your best bet is to call any store you're interested in visiting, to confirm the price and availability of the item you want, before you launch into goose-chase mode. 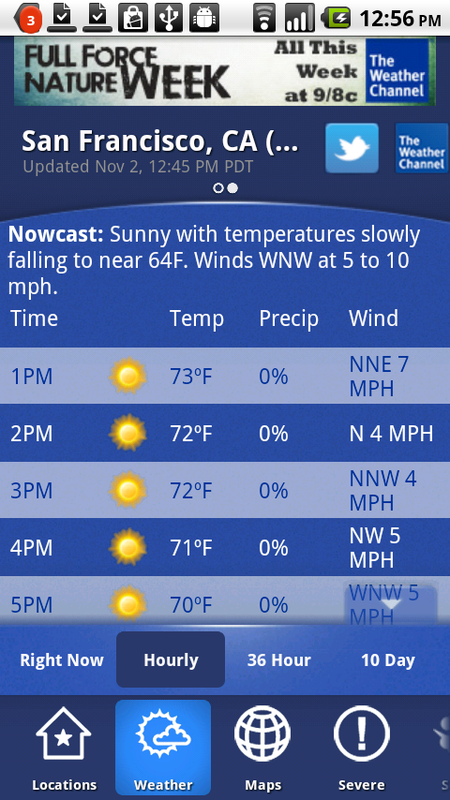 Find out current and future weather conditions with the Weather Channel app. Whether it's a last-minute jaunt to the park or a weekend camping adventure, lousy weather can ruin even the most promising outing. The Weather Channel app gives you the information you need (thanks to current-condition updates, and hourly and ten-day forecasts) to avoid a soggy disaster. 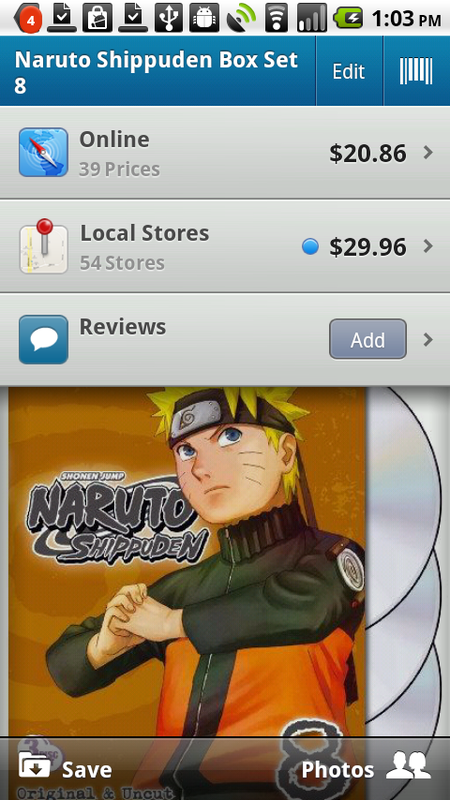 Available for Android, iOS, and BlackBerry devices, this app has a simple, attractive, and easy-to-navigate interface. You can stay in touch with what others are saying about the weather in your area through the "social" category, which presents a list of relevant tweets. And the app's severe-weather notification system will ensure that you won't get caught picnicking in gale-force winds. One drawback: Though the map feature presents the weather in your exact location, you can't move the pin around easily to determine the weather details in nearby areas. Instead, to access such information, you have to go back to the "locations" category and input the appropriate zip code. This is a boon to people living in areas like San Francisco, where the weather may be drastically different between one neighborhood and another.